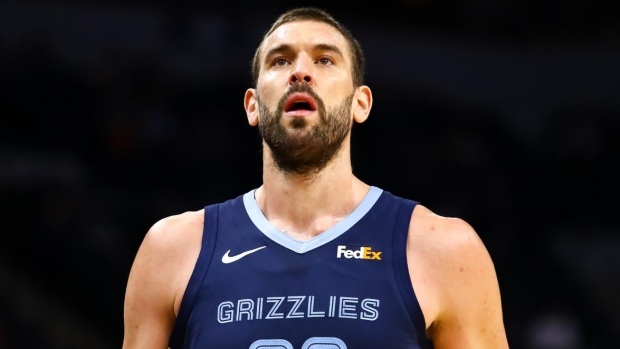 TORONTO — The Toronto Raptors have acquired Marc Gasol from the Memphis Grizzlies for a package including centre Jonas Valanciunas. CJ Miles and Delon Wright will also be going to Memphis. It's a power move for a Toronto team looking to improve its roster as it vies with Philadelphia and Milwaukee, among others, in the Eastern Conference. The 76ers and Bucks have also made major moves as the trade deadline nears, with the Sixers landing Tobias Harris and Milwaukee getting Nikola Mirotic. The move is Raptors president Masai Ujiri's biggest trade-deadline deal since returning to the team in 2013. He made two moves just prior to the 2017 deadline, acquring Serge Ibaka from the Orlando Magic and P.J. Tucker from the Phoenix Suns. That Raptors team was swept by Cleveland in the second round of the playoffs. Toronto's roster will be down 11 after the trade, meaning the Raptors will likely need to make a few more additions. Could be subsequent move(s) to come, certainly subsequent additions. With the Gasol trade, Raptors roster is down to 11. They've gotta add 3 more players somehow. Front court is also a bit jumbled. Does Gasol come off the bench? Does Ibaka go back to PF with Siakam off bench? Prior to his injury, Valanciunas was enjoying a career-high 12.8 points per game (tied with 2015-16) this season and a .575 field goal percentage. He has been linked to trade rumours this week, but said Thursday he hopes to stay in Toronto. "I've been in rumours so many times I don't even look at it," Valanciunas said. "I just know one thing, we have a good team, we have a good future in front of us. I just want to go on the court and play ball and win games. I love Toronto and I want to stay here." Valanciunas, 26, was drafted by the Raptors in the first round (fifth overall) of the 2011 NBA entry draft and is in his seventh season with the team. Wright, 26, is averaging 6.9 points, 2.6 rebounds and 2.2 assists in 49 games this season. He was selected by the Raptors in the first round of the 2015 NBA Draft. Miles is averaging 5.4 points and 1.7 rebounds per game in 40 contests this year. He was in his second season in Toronto, having joined the team during the 2017 off-season.